Bottle of 60 long shelf life tablets of 170 mg. each. During a nuclear disaster or accident, such as war, terrorism attack, nuclear power plant reactor melt down, or radioactive spill, large amounts of radioactive iodine (I-131) can be released into the atmosphere. Taking Potassium Iodide (or Potassium Iodate) pills can protect against radioactive poisoning by "filling" the thyroid with this harmless substance for a period of time; long enough to allow the dangerous radioactive iodine to be "blocked" (not be absorbed), and then naturally dissipate from the area. Up to 99% of all radiation induced thyroid damage can be prevented by taking Potassium Iodide pills. Potassium Iodate is a superior form of Potassium Iodide (KI) because of its extended shelf life and lack of bitter taste. The extra molecule of oxygen in Potassium Iodate (KIO3), can guarantee the Iodates continued freshness without adding stabilizers. 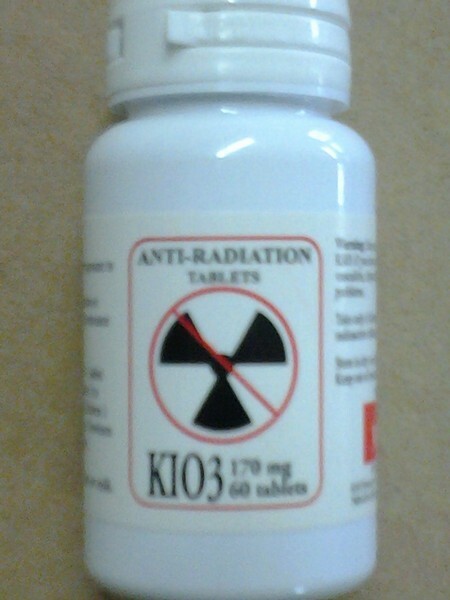 The Potassium Iodate we offer is a 170 mg scored tablet, 60 tablets to a bottle. The recommended daily adult dosage during emergency conditions is 170 milligrams, 85 milligrams for children. Keep tablets sealed, dry, and out of reach of children. If unopened, it should be effective for decades. Use during a NUCLEAR EMERGENCY ONLY.